There is a phrase “wetter than an Otters pocket” which I rather like, describing a period of extreme moistness where everything is damp to the extreme. This is quite poetic for this year’s Mabon Rally held by Cernunnos MCC where it was a bit soggy and even “otter” the ever smiling member of said club looked a tad moist. 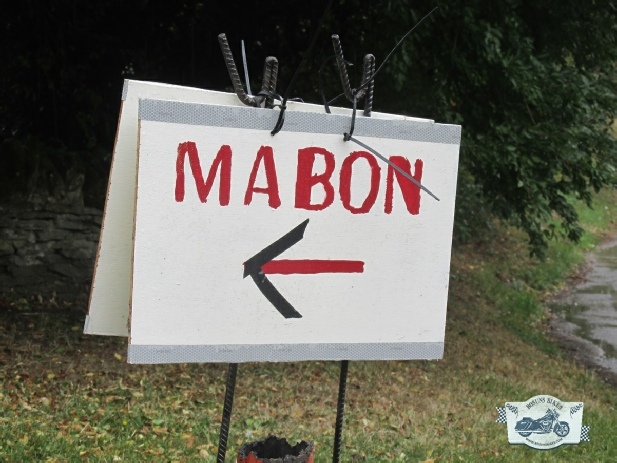 The Mabon has long been one of my favourite traditional rallies a Pub, great camaraderie, good food and a bonfire what more do you need? well possibly not the wettest weekend in months. But it has its own magical feel which draws folk back time after time, well at least 17 times. But after Reg the owner of the Robin Hood pub retired a few ago the pub changed hands and put the club and rally in limbo with no settled home. After a few years in the wilderness as the club tried other venues which never quite had the “mabon” feel, or were being greedy on bar/food it was good to be back at their spiritual home with the pub welcoming them back. Still with a fire too, but now on a fire pit it was a warming sight. Despite the weather those hardy few who attended seemed to be having a great time. Redirecting the silly games to games in the Marquee (amazingly still standing in the gusts) worked well and they were enthusiastically taken part of. Then there is the magic of the warm bar where once ensconced on my favourite stool deep and meaningful discussions (yeah right) are held over glasses of ever changing rally ale. A first as far as I know for any rally was a rally cat in attendance. as a local inquisitive young black cat decided to take up residence in several tents both overnight and during the day, as far as I know Steph did not steal it. So despite lower numbers this year, and the attempts by the weather I can certainly say the Mabon is back home, and I look forward to many more years of the magic.